Atrial flutter is a problem with way your heart beats. Such problems, whether in the rhythm or speed of the heartbeat, are known as arrhythmias. What Happens in Atrial Flutter? Your heartbeat is a sort of electrical circuit. Sometimes the signals that cause it go awry. Atrial flutter results from an abnormal circuit inside the right atrium, or upper chamber of your heart. It beats extra-fast, about 250-400 beats per minute. A normal heartbeat is 60-100 beats per minute. The beat slows down when the signals reach the AV node, a bundle of cells in the upper wall of muscle between the ventricles, your heart’s lower chambers. It usually slows the beats by a fourth or a half, or down to somewhere between 150 and 75 beats per minute. An abnormally fast heart rate is called tachycardia. Because atrial flutter comes from the atria, it is called a supraventricular (above the ventricles) tachycardia. Atrial flutter is closely related to another arrhythmia called atrial fibrillation. The two sometimes alternate back and forth. What Are the Risks of Atrial Flutter? The main danger is that your heart doesn’t pump blood very well when it beats too fast. Vital organs like the heart muscle and brain may not get enough blood, which can cause them to fail. Congestive heart failure, heart attack, and stroke all can result. With proper treatment, atrial flutter is rarely life-threatening. Complications of atrial flutter can be devastating, but treatment almost always prevents them. 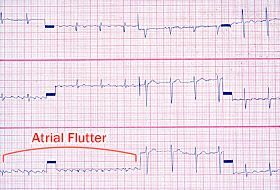 Are There Types of Atrial Flutter? Paroxysmal atrial flutter can come and go. An episode of atrial flutter usually lasts hours or days. Persistent atrial flutter is more or less permanent. The tracings can help pinpoint the type of arrhythmia and where in the heart it comes from. Problems with levels of chemicals, like potassium and calcium, in your heart tissue. If you don’t have symptoms, your doctor might give you this test if she finds signs of atrial flutter when you’re at her office for something else. You might get this test if you have atrial flutter symptoms but get a normal EKG result. That can happen because arrhythmia comes and goes. Or you may just have premature heartbeats, which aren’t dangerous. This test can help your doctor find out if you have a significant arrhythmia and what type. You’ll wear the monitor around your neck for a few days while you go about your normal activities. It’s connected to EKG electrodes attached to your chest. The device records your heart rhythm on a continual basis for 24-72 hours. You can turn it on when you feel something abnormal. Sometimes the doctor can implant an event recorder under the skin, and it can be worn for several weeks or months. This safe, painless ultrasound test uses sound waves to make a picture of the inside of your heart while it’s beating and between beats. It identifies heart valve problems, checks how well your ventricles work, and looks for blood clots in the atria. It uses the same technique doctors use to check babies in the womb. The goals are to control the heart rate, restore a normal sinus rhythm, prevent future episodes, and prevent stroke. Control your heart rate: The first treatment goal is to control the ventricular rate. If you have no serious symptoms, you may get medications by mouth. Sometimes you may need a combination of oral drugs to control your heart rate. You might need surgery to control your heart rate or rhythm, but this is rare. Restore and maintain a normal rhythm: Some people with newly diagnosed atrial flutter go back to a normal rhythm on their own within 24-48 hours. The goal of treatment is to convert the atrial flutter to a normal sinus rhythm and make sure it doesn’t come back. Not everyone with atrial flutter needs anti-arrhythmic medication. How fast your arrhythmia returns and the symptoms it causes partly determine whether you’ll get anti-arrhythmic drugs. Medical professionals carefully tailor each person's anti-arrhythmic medications to produce the desired effect without creating unwanted side effects, some potentially lethal. Prevent future episodes: You can do this by taking daily medication to keep you heart beating at a safe and comfortable rate. Prevent stroke : This devastating complication of atrial flutter happens when a piece of a blood clot formed in your heart breaks off and travels to the brain, where it blocks blood flow. Medical conditions that happen together, such as congestive heart failure and mitral valve disease, greatly raise the odds of having a stroke. If you have persistent atrial flutter, you might need a blood-thinning drug to prevent your blood from clotting. People who aren't as likely to have a stroke and those who can’t take warfarin may use aspirin. Aspirin is not without its own side effects, including bleeding problems and stomach ulcers. The first step in treatment is to restore a normal rate and sinus rhythm. There are two ways to do this: medication and defibrillation. Electrical cardioversion : The doctor gives your heart a shock to regulate your heartbeat. She’ll use paddles, or she'll stick patches called electrodes onto your chest. First, you'll get medicine to make you fall asleep. Then, your doctor will put the paddles on your chest, and sometimes your back. These will give you a mild electrical shock to get your heart's rhythm back to normal. Most people only need one. Because you’re sedated, you probably won’t remember being shocked. You can usually go home the same day. Your skin may be irritated where the paddles touched it. Your doctor can point you toward a lotion to ease pain or itching. Radiofrequency ablation: This is a type of catheter ablation most often used for atrial flutter. Your doctor puts a thin, flexible tube into a blood vessel in your leg or neck. Then she guides it to your heart. When it reaches the area that’s causing the arrhythmia, it sends out radiofrequency energy (similar to microwave heat) that destroys those cells. The treated tissue helps get your heartbeat regular again. Heart rate medicines: The most common way to treat atrial fibrillation is with drugs that control your heartbeat. These slow your rapid heart rate so your heart can pump more effectively. Most people take a medication called digoxin (Lanoxin). Anticoagulants: These drugs make your blood less able to clot. This lowers the odds that a blood clot will form in the heart or in a blood vessel and lead to a stroke. Most people known to have atrial flutter will be taking prescribed drugs. Avoid taking any stimulants. Talk to your doctor before taking any new medications, herbs, or supplements. Atrial flutter does raise your chance of having a stroke. But if you don’t have other heart disease, your outlook is generally quite good. If it happens once without serious heart or lung disease, you may never have it again. If you do have other heart disease, your atrial flutter may come back. If that happens, you should see a heart specialist (cardiologist). Noel G. Boyle, MD, PhD, co-director, cardiac electrophysiology, assistant professor, Department of Internal Medicine, Division of Cardiology, University of California, Los Angeles School of Medicine. Theodore A. Spevack, DO, director, chairman, program director, clinical associate professor, Department of Emergency Medicine, St. Barnabas Hospital, New York College of Osteopathic Medicine. Kathryn L. Hale, medical writer, eMedicine.com. Alan D. Forker, MD, program director of cardiovascular fellowship, professor of medicine, Department of Internal Medicine, University of Missouri at Kansas City School of Medicine. Mary L. Windle, PharmD, adjunct assistant professor, University of Nebraska Medical Center College of Pharmacy; pharmacy editor, eMedicine.com. Anthony Anker, MD, attending physician, emergency department, Mary Washington Hospital, Fredericksburg, VA.